Bar Carerra is Spanish. This fact alone should make you want to grab your amigos and head on down to the East Village – rapidamente! I say this because although there are plenty of tapas bars in NYC there are not many authentic Basque wine bars around town. While the bar does not go so far as transport you to the Basque resort town of San Sebastian, it is a worthy escape from the ale houses and cowboy bars that litter the surrounding East Village. The bar is minute in size, so not a good place for a big group but for a nice glass of wine and a snack before dinner or a leisurely and convivial evening of wine and tapas the place cannot be beat. 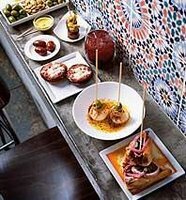 In short, if you are looking for more casual Spanish vibe and less Patatas Bravas, Bar Carrera is the place for you. Salud! I love this place. I just came back from my first real trip to Europe, and loved Spanish wine. Saw the sign out of the corner of my eye and peeked in, and now it's the spot for my fiance and I.